Find the very best email provider for your creative business. Finding the best email provider isn't a top concern for many designers. It's not something you tend to think about much; most people just use the personal email address you get from your ISP, with maybe a Gmail account on the side and probably a work account too, and that generally works just fine. 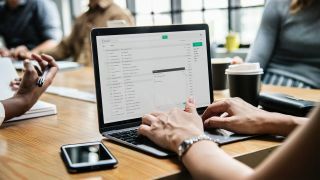 If you're running a creative business, though, at some point you'll need to think a lot harder about email accounts, especially if you need to send large files or set up new addresses for employees. If you've set up web hosting for your company then it almost certainly comes with enough email addresses for your needs, but is the entire package going be enough? In this article we'll explore some different options, to help you find the best email service for you. A badly set-up email service can be worse than none at all, especially if it has inadequate spam filters, won't let you organise your inbox, or if you can't access it using your preferred email client. And if you're running a business and you can't get your email service to work with your company's domain then it's not going to give a great impression when you're contacting clients. With all this and more in mind, here's our rundown of the best email providers around. Choose wisely. You're probably already using it, so why not step it up? There are plenty of reasons why you might want to use Gmail for your business. The most compelling of which is that you're probably using it already, so why waste time getting to know a completely new email setup? There's plenty to recommend Gmail as your business email service; its clean, clutter-free interface makes it easy to organise your messages, with emails arranged into conversations and automatic filtering of messages into tabbed categories that mean you can focus on the stuff that matters. Its heavyweight spam filtering does an admirable job of keeping your inbox junk-free (although sometimes it's a little over-zealous – you'll need to take a regular look in there to make sure it hasn't squirreled any important messages away). And if you have accounts on other services, in most cases you'll be able to manage them from within the Gmail interface. With 15GB of storage shared across all your Google products you're unlikely to run out of space quickly, but if you need more power then there are some great options to be had from Google's paid G Suite product; with the Basic plan for $5/£3.60 per month you get 30GB, plus unlimited group email addresses, 99.9% guaranteed uptime and 24/7 support. It costs a little more than other companies' email-only deals, but it's worth it for the additional features. You also get custom email addresses and migration tools to help you import old messages from other services. Best of all, you won't see any more adverts. Gmail's appeal is partly down to the fact that it's grown from an email package into an entire productivity suite that links up seamlessly. Microsoft has had the office stuff nailed for years, so hooking its email offering into that is a no-brainer. If you're already using Office 365 then you can easily switch your email over to Outlook at no extra cost. The paid version of Outlook with Office 365 is an attractive prospect; with it you'll get an ad-free inbox, plus 50GB of mail storage that you don't have to share with other Office apps as there's also 1TB of OneDrive storage thrown in as well, so you're unlikely to find yourself low on space. You'll also get file recovery from malware attacks, offline working, professional formatting tools and phone- or chat-based support. Prices start at $6.99/£6.49 per month for the personal plan. Even if you don't take up the paid version there's plenty to recommend Outlook. Like Gmail it gives you 15GB of storage as well as the ability to attach files from cloud services such as OneDrive, Dropbox, Google Drive and Box, making it simple to send files to clients. The web interface will be pleasingly familiar to anyone who uses the desktop version of Outlook, with a focused inbox that'll show you only the most important messages, and the option to automatically add scheduled events to your calendar. The only real downside is that you don't get quite as much control over settings as you do with something like Gmail. But if you're happy with Outlook's default options then you should get on just fine with it. It's been a very long time since Yahoo was one of the biggest names on the internet, and the intervening years haven't been kind to it. So it might be a bit of a surprise to discover that its Yahoo Mail service is a strong, professional offering that's well worth checking out. Perhaps its most appealing feature from a creative point of view is the amount of storage it gives you: with 1TB you're going to be hard pushed to fill it up, even if you're slinging huge files around regularly. On top of that you get a well-designed interface complete with custom folders and one-click filters to help you organise common messages and content, as well as Facebook integration and the ability to send text messages as well as emails. If you'd rather use your own email client then it's pretty straightforward to set that up too. Step up to Yahoo Mail's Pro plan and you'll get more options, including the all-important ability to use a custom domain that'll be auto-renewed for as long as your subscription is active. You'll also get the ability to import contacts from Facebook, Gmail, Outlook and more, plus an assortment of productivity tools and as many mailboxes as you choose to pay for. Prices start at $3.49 per month, or $0.99 for mobile-only. Let's be clear about this: if you're a creative then you're likely to run up against the restrictive side of ProtonMail pretty quickly. It only gives you 500MB of online storage, something you could easily burn through in a few days, and it only allows you to send 150 messages per day. On top of that, its online client is severely lacking in options that you'll get from most other email providers, such as folders, labels and smart filters, and you can't set it up to work with your existing email client. So why would you bother? Basically, ProtonMail's aimed at anyone who takes their privacy seriously, and if you're working on confidential projects then you might find it useful as an additional email service working alongside your primary address. You can sign up anonymously, it provides end-to-end encryption on all the emails you send, and it won't log your IP address. Thanks to address verification you can be certain that the people you're talking to are who they say they are, and it also supports PGP encryption. If you need more from it then there's a Plus plan for $5/month that gives you 5GB storage, 1,000 messages per day, custom domains and folders, labels and filters, and there's also a Business plan with even more options. If security matters to you then it's worth investigating, but it's almost certainly overkill for most creatives. Running a creative business with irregular payments can often mean that funds are short, so any service that won't cost you much – or indeed anything at all – can be well worth investigating, and Zoho Workplace is just that. It's a business-oriented email service that also gives you collaborative tools, document management, an online office suite and other extras for free. You'll get support for up to 25 users with 5GB of storage each, as well as the use of one custom domain, and a web-only email client with a strong set of features such as folders, tags, filters, smart searches, and more. As a free offering, it's brilliant, but if you choose to pay some actual money then it gets even better. From $3 per user per month (paid annually) you'll get the ability to use your own mail client, as well as 30GB storage and a 30MB attachment limit, plus plenty of other features such as multiple domain hosting and domain aliases. And if you need more than that there's a Professional plan that give you 100GB storage per user and 40MB attachments, plus video conferencing and more besides.